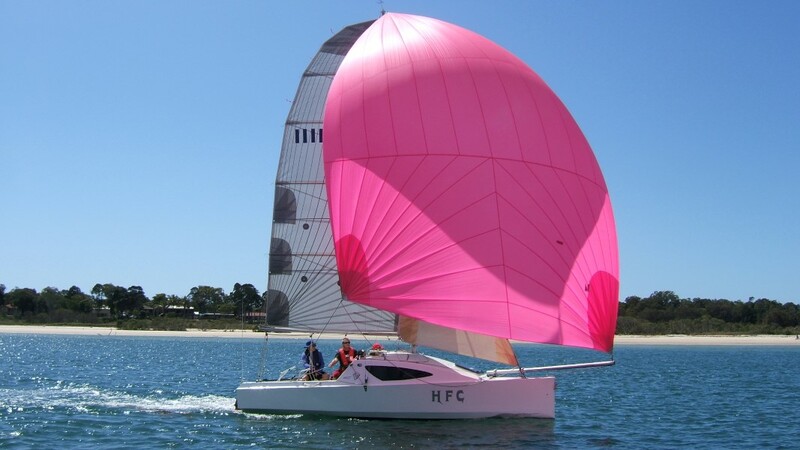 HFC is a Colson 6.50 metre trailer yacht built to comply with Australian trailer sailer regulations. 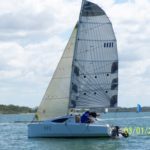 I have always admired the Mini Transat 6.5 metre yachts but the reality is their 3.00 metre beam and canting keels give them a limited resale appeal. In Australia there has been insufficient enthusiasm to date to warrant building such a vessel. 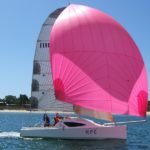 I have however incorporated many of the features commonly seen in the mini transat boats in HFC but have kept her simple and beach-able. 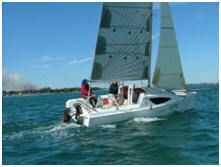 She is designed to the maximum 2.50 metres beam which is carried right through to the stern. The distinctive chine above the waterline results in a powerful, shallow hull form and is a development of my earliest designs. 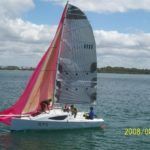 The aluminium foiled centreboard is fitted with a small bulb and pivots up flush with the bottom of the hull allowing the vessel to completely dry out. The circular aperture in the cockpit floor is filled with a snug fitting foam plug. Her twin rudders kick up. 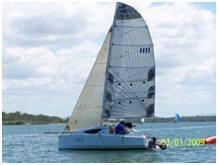 The mini transat yachts carry tall, 9 metre plus, masts off set by 2 metre drafts and 300kg bulbs. This is some what impractical in shallower coastal and inland areas. 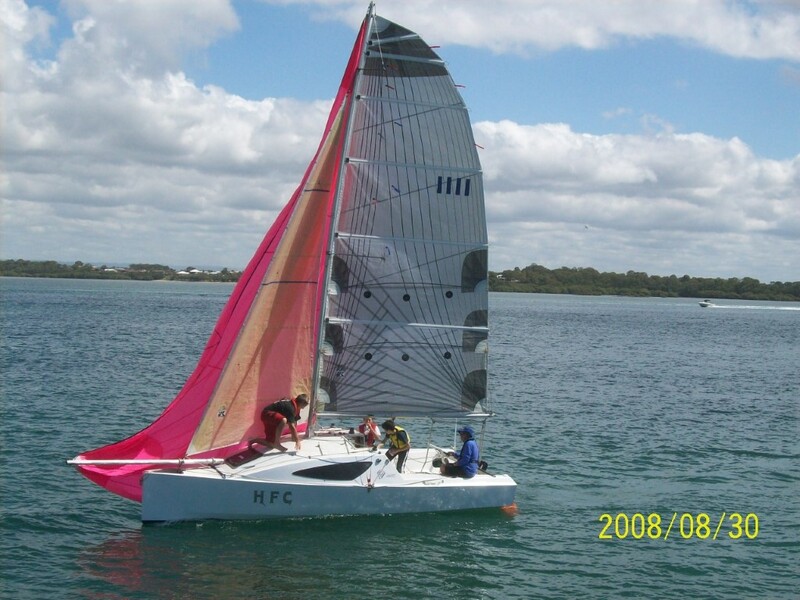 With HFC the draft has been kept moderate and so emphasis has been on a low aspect ratio rig with a large roached mainsail. 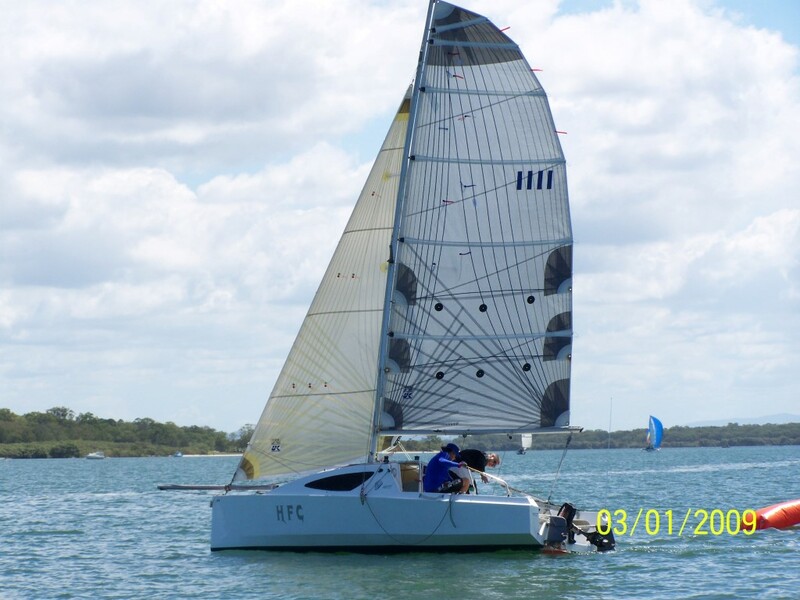 The light spar is set up with out backstays in a similar fashion to the skiff classes.A notable innovation is the canting prod mechanism which allows the prod to be rotated from the cockpit via a semi-circular track and still be retracted in to a watertight housing. All operations are carried out from the cockpit. The interior of the vessel is spacious as the cabin top runs out to the Gunwale. 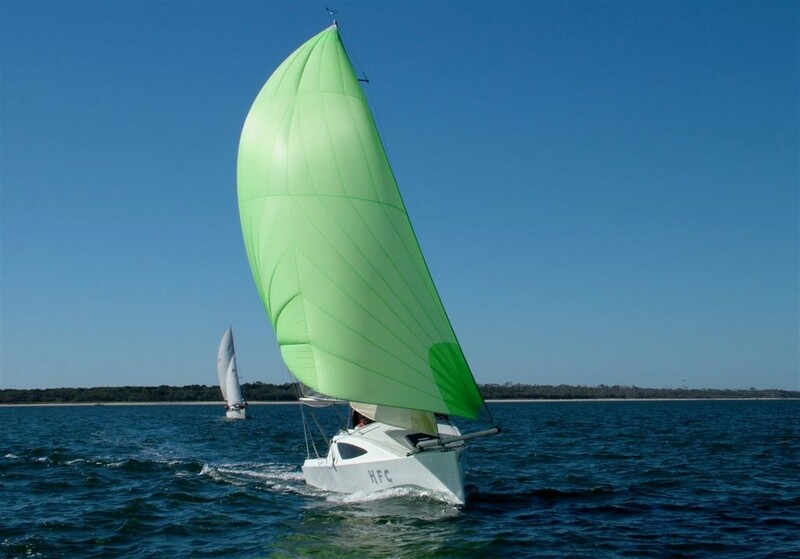 Access forward is over the cabin top which is considerably easier than around narrow side decks. 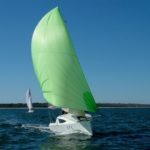 This also improves the ultimate stability of the vessel in case of knock down. The construction technique is cost efficient and robust. The yacht is strip planked in “Kiri” below the chine and sheet plywood above. The cabin top is strip planked and the cockpit is sheet plywood. This minimises fairing and keeps the weight down. I consider HFC to be of moderate displacement and scantlings are robust. The construction technique is ideal for amateur builders.